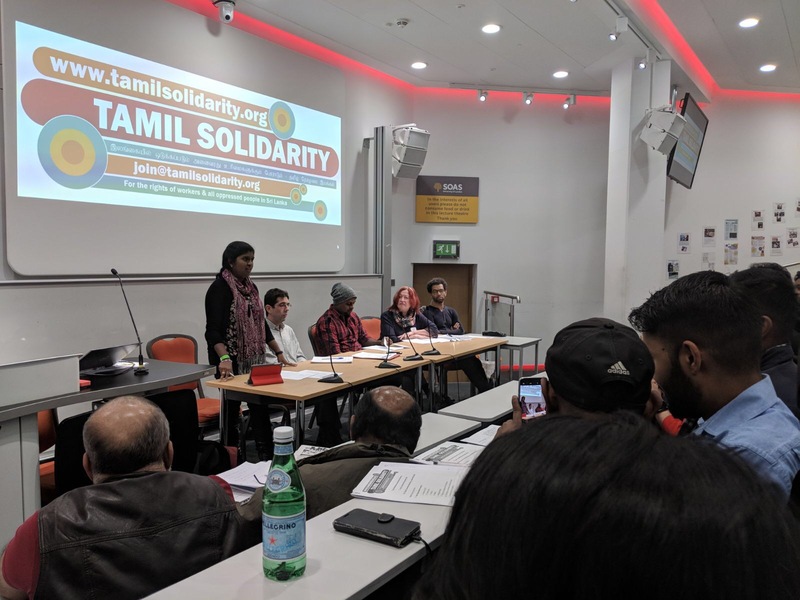 Campaigners were buzzing on Saturday as Tamil Solidarity’s Annual General Meeting prepared the ground for what will be a dynamic 2018. Teams are working on all the key aspects of the campaign. A new young group of activists is taking on leading roles. An enlarged National Coordinating Committee has been elected to bring it all together. Without doubt 9 December 2017 will go down as an important date in the history of Tamil Solidarity. In addition to campaign members, the AGM was attended by Hugo Pierre, representing the National Executive Council of Unison, the largest public-sector trade union in Britain. 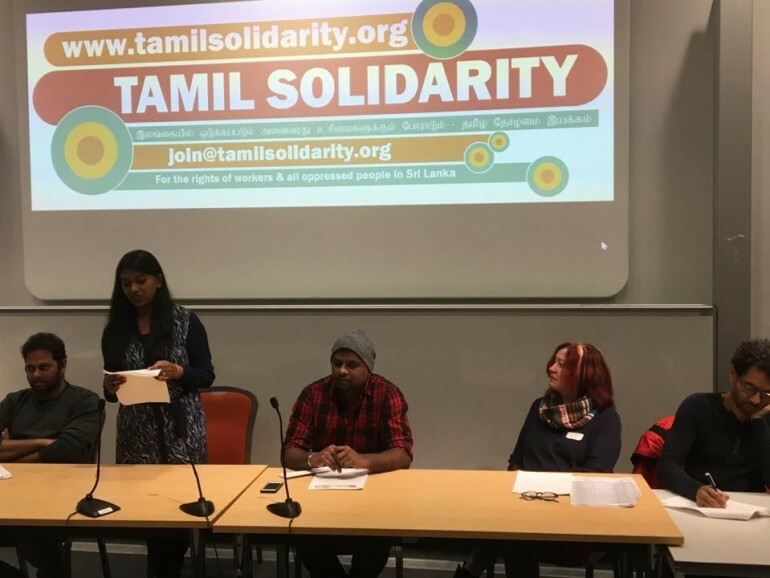 Unison organises 1.2 million workers, mainly in local councils and the NHS, and has been affiliated to Tamil Solidarity since 2012. Two important international guests were also present: Siritunga Jayasuriya, general secretary of the United Socialist Party, Sri Lanka, and Jagadish Chandra, general secretary of New Socialist Alternative, India. Chaired by PA Nadesan, Tamil Solidarity’s joint national secretary, the day began with a review of 2017, another busy and productive year, introduced by campaign organiser, Manny Thain. 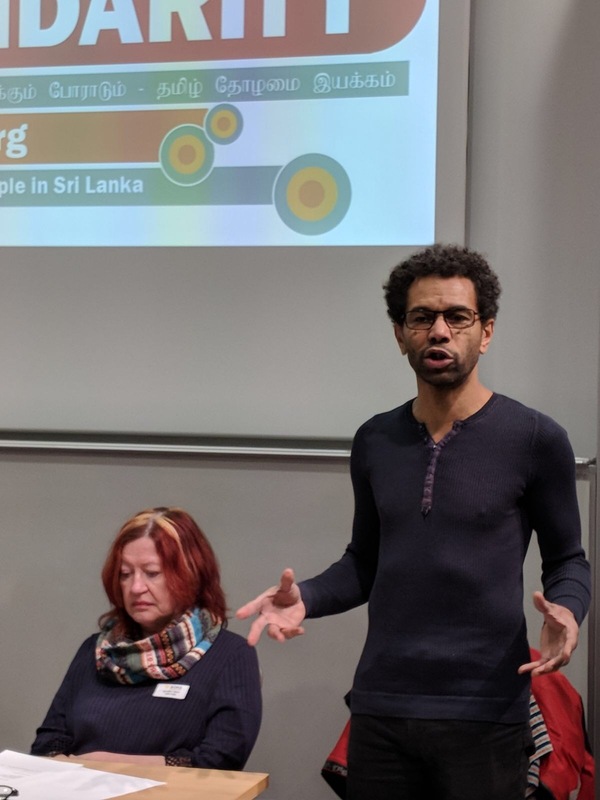 Next up was a report by Isai Priya of our work with our sisters and brothers in the workers’ trade union movement: the conferences we attended and spoke at, the solidarity we gave to low-paid hospital workers and fast-food strikers, and the backing we have received from them. Margaret Trotter, the chartered accountant who audits Tamil Solidarity’s accounts, presented the campaign’s books for the last financial year, with an update from Isai. As a campaign run solely on the income from affiliated trade unions, members’ subs, and campaign activity, Tamil Solidarity has always had a very serious attitude to finance and fundraising. We do not receive or seek money from big business, it all comes from our work on the ground and we account for every penny. The AGM was the opportunity for the members to ask questions, to check the books and agree the accounts. One of the many breakthroughs this year was the launch of Ethir, Tamil Solidarity’s media hub. Dhanuvintha Tharmarajah, chief editor of ethir representing the media team, explained how it was set up and the instant impact it had. It was not an easy task. It took a real drive to raise the money to buy the equipment but Dhanu and others made sure it happened. And it has been truly groundbreaking. 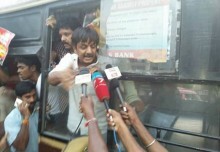 Street interviews of young Tamils during the general election campaign went viral. Debates on Catalonia and the national question in Spain raised parallel issues around Tamil self-determination no one else was putting out there. Discussions on women’s rights and many other issues have seen Ethir reach a whole new audience, through the website, on facebook and youtube. Stay tuned, there’s more to come! Lawanya Chandra gave an inspiring report about the Refugee Rights campaign. Unlike other groups, Refugee Rights is run by refugees and asylum seekers themselves. As a result, it has a real understanding of the great difficulties refugees face. Out of that day-to-day experience, Refugee Rights has pushed key demands: the right to work; for £10 an hour minimum wage; trade union rights for immigrant labour; for free legal advice; and closing down the detention centres. 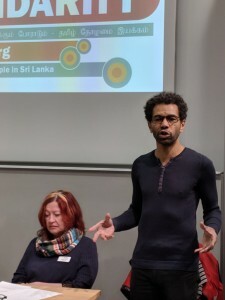 Refugee Rights was the first campaign to take up the issue of £1/hour in detention centres and have taken placards and slogans at the national demos. This issue was later reported by the Guardian and BBC. A real boost came this year with the launch of these demands in the trade union movement at the Refugee Rights session at the Socialism 2017 weekend event organised by the Socialist Party in November. 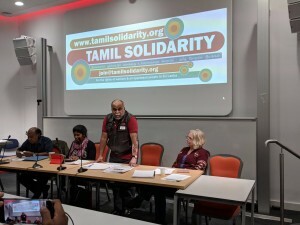 The vital need to increase funds for our campaigning work was hammered home by Rajaranjan Pushparagavan, and Nadesan outlined the plans for developing Tamil Solidarity work in local areas. 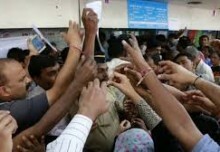 TU Senan reported on the situation in Sri Lanka and the development of campaigning work there. This is an exciting prospect which will be a main focus in the year to come. Senan also proposed the new 20 member National Coordinating Committee, which was duly elected. This NCC will enable us to discuss, plan and achieve all of our ambitious targets in the new year. The AGM finished up by sending a message of support to young Afghan asylum seekers in Sweden who are fighting deportation, and to the school students organising solidarity strikes with them. Their fight is our fight. No deportations! Education rights for all! So, watch this space. If you like what you see, why not contact us? Can you help? Donate to our campaign funds to help us reach our goals. Join us.